You know the one about not judging a book by its cover. A top three of Lewis Hamilton-Nico Rosberg-Sebastian Vettel from the British Grand Prix just passed does not in itself do much to quicken the heartbeat. Rather it seems a result standard, almost monotonous, for the 2015 season to the point of being recitable with ones eyes closed. Believe me though this was no standard tepid fare for this campaign; there were a good few adventures in getting that top order. 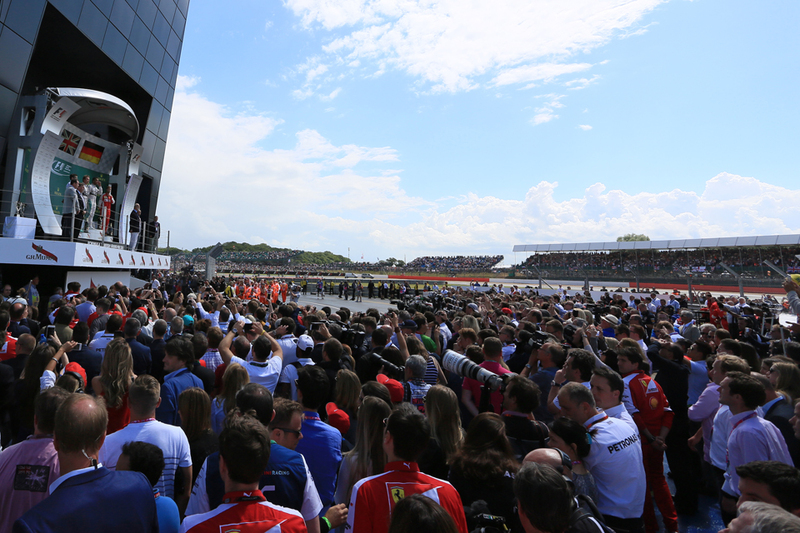 In the nick of time and in front of a huge crowd of 140,000 F1 delivered a fine Sunday's entertainment. Perhaps it's a demonstration of what a few people have been arguing that current sport doesn't have cancer, more a headache. And today it only required an unusual start and later good old fashioned British summer weather to stir things up sufficiently. Many of the locals will be happy with the victor too, home representative Lewis. As previously noted there are a few parallels between him and the quintessential British fan favourite of yore in Nigel Mansell. To cite a few overarching examples they share stunning pace and aggression, a tendency to wear their heart on their sleeve as well as an uncanny ability for drama and intrigue somehow to follow them. Rather like with Our Nige too Lewis appears to have a knack of things going his way somehow at this Silverstone venue. That whatever else happens to him here he descends straight to victory like a heat seeking missile. Anything the race threw at him this time, and it was a lot, Lewis one way or another emerged from the other side looking yet more in command. And in another parallel the win meant Lewis matched Mansell's three F1 triumphs at this circuit. The first thing today threw at Lewis, and at Nico also, was as mentioned the drop after the red lights went out. Both left the line as if with anchors attached - there wasn't obvious explanation afterwards beyond that both drivers complained of low grip and poor traction on this surface - and the Williams pair from the second row swept by; Felipe Massa partying like it was 2008 with a fine lead. Lewis managed to dive under Valtteri Bottas at turn four to reclaim second, but after an early safety car (due to some lap one Lotus and McLaren pinball set about by Daniel Ricciardo making contact with Romain Grosjean) Lewis couldn't help attacking Massa immediately at Club, but ran over some kerbs which allowed Bottas to nip back past. But those expecting the imperious Mercs to sweep imperiously by the Grove cars were proved wrong. 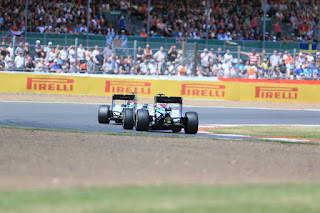 The four of Massa, Bottas, Hamilton and Rosberg ran in that order for the whole of the first stint, with the most probable overtake among them rather than involving a silver car looking like that of Bottas gazumping Massa. The Finn was visibly the quicker at this point. Massa a few times had to get defensive even though the messages from the Williams pitwall sounded initially a lot like it was ordering them to hold position, a stance relaxed a little later. A few wondered whether, not for the first time, Williams was missing a trick with apparent strategy timidity. Would not a quicker Bottas have been able to stretch clear with Massa acting as rear gunner holding back the Mercs? That way the Finn at least would be protected from a Merc undercut later. And this, combined with it being a likely one-stop race in the dry, Mercedes to win would have had to pass Valtteri on the road, something not at all easy as demonstrated. 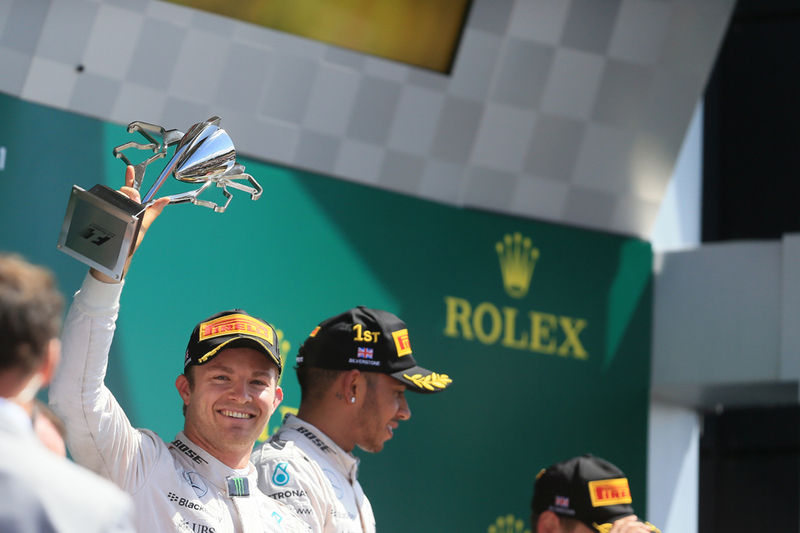 It had occurred to Bottas too: "I feel I would have been able to have pulled a gap. I'm guessing [I could have gone] half a second per lap because on the in-lap I was nearly one second quicker." 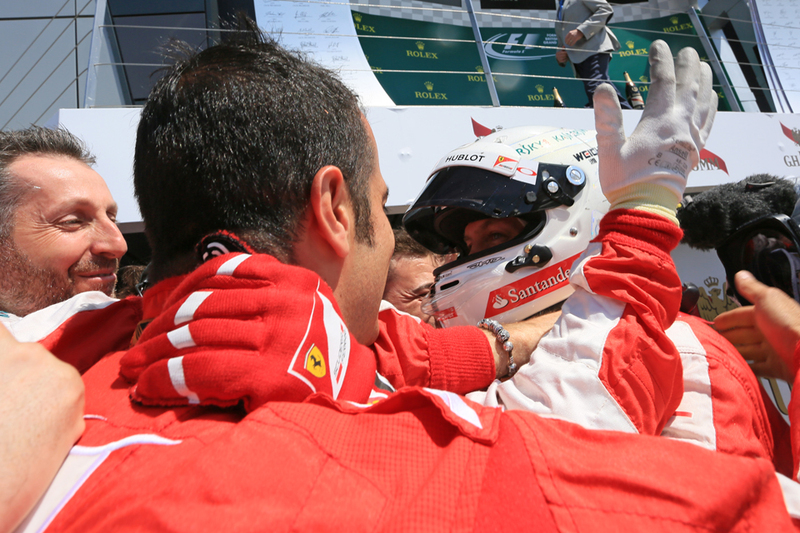 Indeed as far as Bottas was concerned he was told to stay behind Felipe: "No-one should let anyone by. That's not racing, but it would have been nice to have been able to race when I had the best opportunities, but I wasn't allowed to overtake. "Possibly there were things we could have done better in the race." Rob Smedley's reasoning afterwards for not doing this didn't make sense to a lot of people. But whatever was the case later events ensured the point was moot. As it was the Williams were indeed blitzed by the undercut. That and a combination of Mercedes getting smart harnessed to Lewis's oft-demonstrated driving skills. Mercedes calculated the lap that it could pit for (theoretically) the only time and Williams would be reluctant to shadow it as it would be too concerned about its tyres 'hitting the cliff' before the end. 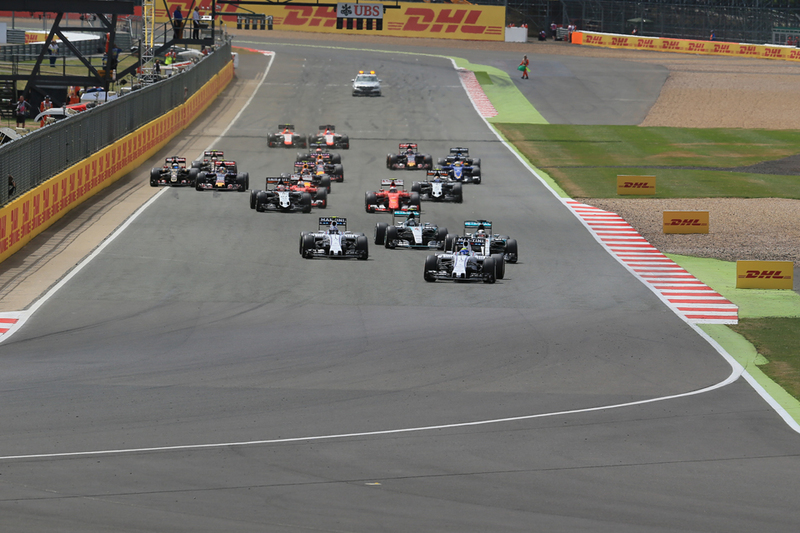 As is the Merc way too Lewis as the team's leader on the road was the one to get this most favourable lap to stop. 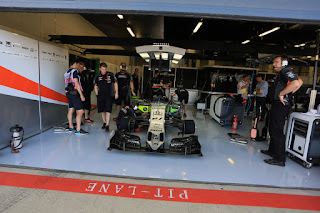 Lewis helped the shebang with an extraordinary in-lap described by Williams' Pat Symonds as "stunning" and an out-lap the man himself described as "great". It helped his stop was 1.4 seconds quicker than Massa's too, and it just got him back out with clear road. 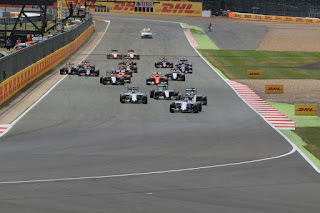 By the time all four had pitted in turn Lewis was a clear three seconds plus ahead of Massa now in second. Perhaps best of all for him it didn't work out for his team mate Rosberg especially and he remained in fourth. "It was not nice...I just couldn't get by these Williams. Just impossible" noted Nico later. Lewis then edged rather than sprinted clear, but still it looked all over bar the shouting. Or rather bar the weather. It had been atypically brilliant for most of the Silverstone weekend but many forecasts had rain around for some point of the afternoon, and sure enough it arrived for later in the race. Teams began to speak of some arriving initially, and in greater quantities later. That's pretty much exactly how it happened. During the precipitation's first appearance some, mainly those with little to lose towards the back though with the curious addition of Kimi Raikkonen, tried switching to intermediate tyres. It didn't work for them. In another Silverstone way only part of the track was wet - around Woodcote - and the rest bone dry where those on inters were brick slow and no doubt chewed their tyres up too. Nevertheless the day threatened to change as Williams - again not for the first time - really struggled on the perfidious surface and Rosberg made his way past them up to second. Niki Lauda admitted afterwards that without the rain's intervention it would have been a struggle to get Nico higher than fourth. In a weekend wherein he often had been the pace setter and had little go right for him in the race it looked for a fleeting moment that the German might win out after all. He homed in on his team mate to the tune of two seconds a lap and appeared all poised to seize the lead. "It was a great phase" he said afterwards, "when it started to drizzle I was happy of course as it would give me a great opportunity. And I felt good in the car...I was a lot quicker [than Lewis] at the time, I believed that I'm going to get him as well now." He did seize the lead, but in circumstances that didn't work out well for him. Just at this point the rain arrived for the second time and it was harder and covered all of the track. And it was at this point that the day was finally decided. And by Lewis. With Nico not far away he dived into the pit for inters and while most observers wondered at that point if it was hasty it proved inspired; it was at about that moment that the weather really turned as did the type of tyre that was by far the most beneficial. Lewis on inters sailed past the slick-shod Massa a couple of corners later to underline the fact. There is a thin line between madness and genius, as they say. "I was pretty sure it was the wrong call" said Nico. "It was still touch and go at that time, so I was actually quite happy that he boxed." "But it was the right call in the end - it started raining more on that lap, so that was it. "I had to take that chance [of staying out], because just following Lewis into the box is a definite lose for me, so I might as well stay out for one more lap at least and it didn't work out." Nico was forced to crawl on his own in-lap and by the time he'd fitted inters and was back in the action he was some nine seconds shy of his team mate. Briefly he looked like he might be able to close in again but about as soon Lewis took the time back. Indeed the gap if anything stretched out gradually over the race's remainder. 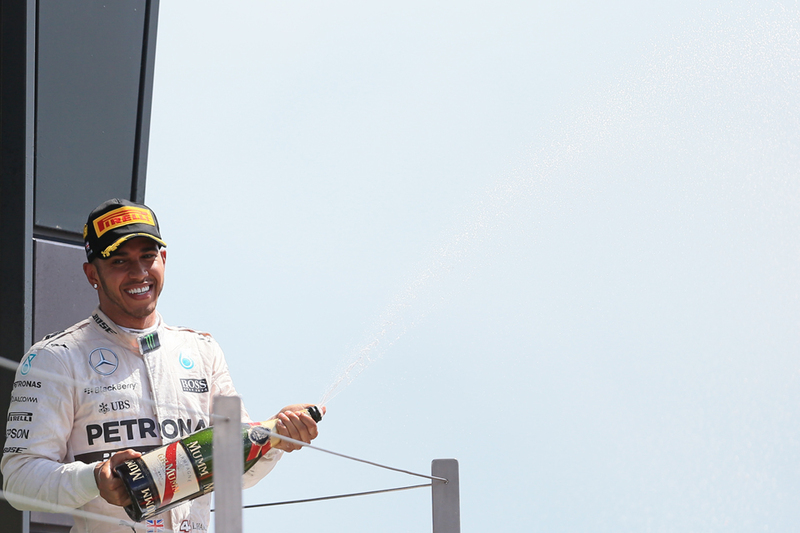 "Usually when I put the wets on, that's my ground - I enjoy that" Lewis reminded us after the event. He was 11 seconds up the road at the end. Most of the locals liked that of course. 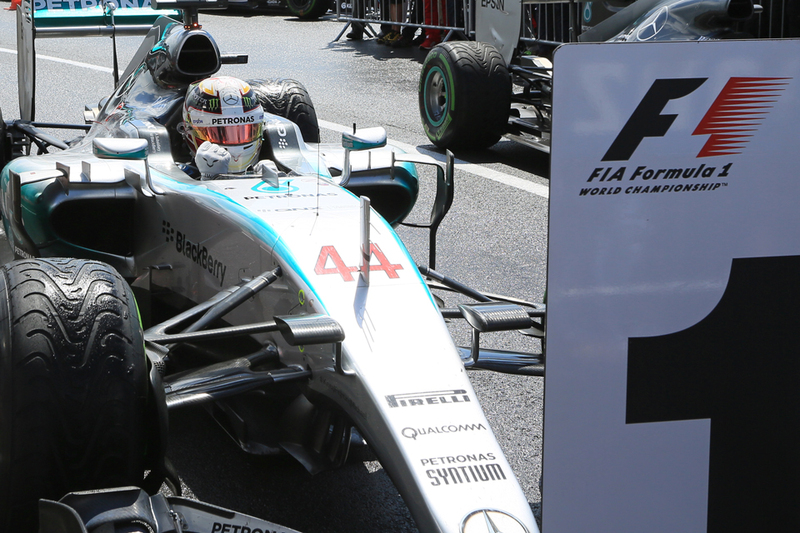 By all accounts the perfectly-timed call to pit for inters was all Lewis's too. Boss Toto Wolff and technical head Paddy Lowe both confirmed as much later. Lewis meanwhile was self-deprecating "I think it's the first time I made the perfectly right choice to say I was coming in" he said, "because I could see the rain coming more". "The rain came and I lost temperature in my front tyres. It's always trickier for the guy in the lead, you are the first one to get to it and it's questionable how much risk you take." Lewis admitted it too: "It's really a lottery; sometimes you get it right and sometimes you get it wrong...finally the one that really needed to count, counted". But whatever was the case Lewis's call worked a beaut. And as you'd imagine he was delighted with his home win: "Just a very, very special weekend for me" he said contently. "To see so many fans out this weekend, I thought that I'd seen it all here last year but I'm really just... I love those guys." "I kept seeing as I was going around, turn seven, the last corner I could see in the crowd just cheering me on every time I came by and just spurring me along. I just didn't want to drop it for them. And really I'm also very honoured just to be here representing the Brits, to have the British flag up there." Perhaps a couple of vital cards fell Lewis's way this weekend but there there has always been an art of plugging away and delivering at vital moments, which is what he did on both the Saturday and Sunday. And the result firmly checks Nico's recent momentum. Lewis's title lead is now back up to 17. Another to have some cards fall his way was Sebastian Vettel, in another feature that may have a familiar ring. He pitted on the same lap as Lewis and vaulted up to third as a consequence where he finished, thus after a weekend in which he'd been subdued and often been shy of his team mate he somehow salvaged a respectable result. Seb does seem to have a charmed existence. "I could see some rain in the air...obviously we did a great call just in the perfect lap to pit to make up a lot of ground and finish on the podium" he said. "Just didn't come together the whole weekend for us, but then obviously we were able to turn it around in the end and it's good points...I just had a gut feel to say 'box box', just before pit entry". For all of Seb's habitual brave face it was hard to deny however that this weekend was a tough one for Ferrari in the normal run of things - behind the Williams and in the ballpark of the Red Bulls rather than its usual clear best of the rest. And while there have been protestations about the track and the weather being peculiar this time from the red corner there also is a burgeoning sense around that Ferrari's competitive trend has been gently downward in recent weeks. Little wonder boss Maurizio Arrivabene stated later that "the glass is half empty, not half full". The Williams struggling in the wet sank back to a distant P4 and P5 with Massa still ahead by the end, and indeed with another lap Daniil Kvyat likely would have taken the latter place. Kvyat continued his improved recent form and his Red Bull machine this time was good for him to run with the Ferraris for much of the way. He however didn't pit on the same lap as Seb then compounded matters by spinning on his own in-lap. His boss Christian Horner reckoned a podium might have been possible without these, but took heart at the general improved showing. On a day when many dropped it at many stages Force India was one of the few teams out there to maximise things and bagged another double points finish with P7 and P9 with Nico Hulkenberg ahead. Its new 'B spec' car does indeed look encouraging. 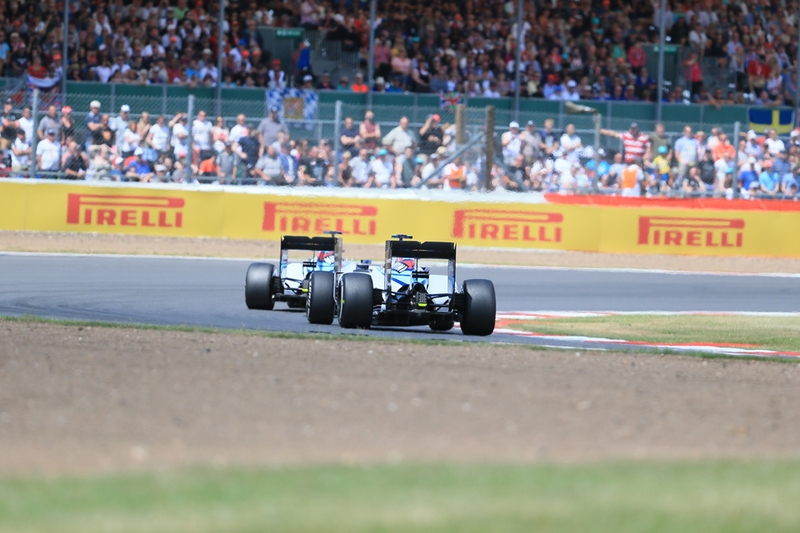 While, and make sure you're sitting down for this one, McLaren and Fernando Alonso completed the points. In reality it didn't owe much to a Woking breakthrough, much more to a high attrition rate this time combined with the Spaniard getting ahead of Marcus Ericsson's Sauber in the late rain mixer Ericsson had the misfortune of, having been one of those to pit upon the first arrival of rain, to pit again for slicks at precisely the moment that the proper rain arrived... Little wonder that Alonso noted afterwards that "it's not party time". Again as with Mansell Lewis does know how to work such a feel-good factor in his home event with those watching on. No doubt a few of them would have been content with a Lewis win whatever else happened. But even so perhaps this time given how we got there the sport as a whole was the one feeling the greatest relief that this sense of new found feel-good and come its way.